It’s pretty hard to remember what to do after the initial shock and surprise of an accident. In the confusion of the moment, you may forget a few things. The following information will assist you. Stop your vehicle and move it to a safe nearby location. Check to see if anyone is injured. Call 911 for medical assistance. Make sure everyone involved moves to a safe location. Contact the police. They will let you know if an officer needs to be present at the scene. DO NOT GIVE A STATEMENT TO ANY INSURANCE COMPANY WITHOUT AN ATTORNEY. CONTACT OUR OFFICE FOR ASSISTANCE IMMEDIATELY. 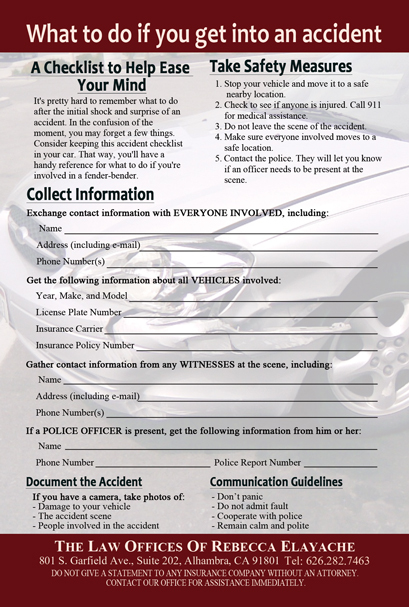 Consider printing this accident checklist and storing it in your car. 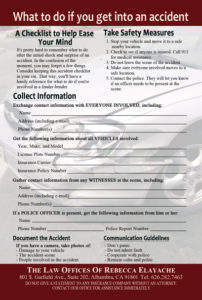 That way, you’ll have a handy reference for what to do if you’re involved in a fender-bender.